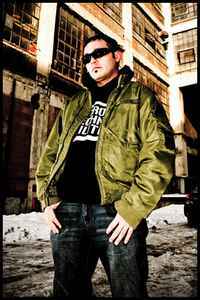 DJ Seoul is one of America's leading ambassadors of Detroit Techno and Techno Bass. As a soldier for the Detroit Techno Militia, this powerhouse DJ has been spreading the gospel of Techno throughout the world for the past fifteen years. With lightning fast mixing skills and exceptionally technical scratches and juggles, Seoul brings an energy to the dancefloor that is rarely seen. As a producer, his work on the Detroit Techno Militia record label and his remixes for Drugaci Exhibitions have garnered him worldwide acclaim. DJ Seoul gives the crowd one hundred percent every time he performs. This energy is clearly visible and reciprocated by the audience. If a citizen of Detroit could be considered an asset, then DJ Seoul would be one of the most beloved. By representing his home town globally and by playing Detroit Music, Seoul continues to carry the torch that was handed to him by the greats that came before him. Playing music, from Electro, Techno and Acid, to House, Soul and Rare Groove, this trend setting performer has become known for his style of bringing a Hip-Hop Turntablist flair for mixing and scratching to his DJ set regardless of genre. Before he was a full-time DJ, Seoul spent many years in the music industry. Raised on the East side of Detroit, he began his musical career at a young age through various counterculture sounds and movements. His formal training began in 1985 with the drums and continues today with both traditional and electronic instruments. Coming from a very diverse musical and cultural background, Seoul cites many different personal influences including Jeff Mills as The Wizard, Terrence Parker, Dave Clarke and Underground Resistance. In 1996, he co-founded the Bang Tech 12 management company with Greg Montgomery aka. DJ Eclipse. Bang Tech 12 has represented many acts over the years that have gone on to influence the world, including Magda, DJ Minx, Jerry The Cat, DJ Mo Reese and Jacq. Bang Tech 12 has grown and continues today as a leader in the industry with branches in five states. With over 30 different acts under their wing, Bang Tech 12 is a symbol of quality that spans the entire globe. In addition to a fifteen year DJ career that has taken him across the world, DJ Seoul writes and produces electronic music with great attention to detail. His personal studio is filled with vintage synthesizers and drum machines which he uses to create music with a very distinct sound. He has been featured on Television and Radio worldwide including FOX 2 News: Detroit, and Dave Clarke’s White Noise Radio on 3VOOR12 as well as countless radio stations across the United States. One can find DJ Seoul's production work worldwide on the Detroit Techno Militia and Drugaci Exhibitions record labels, as well as his own label; Bang Tech 12.